Back cover blurb: 'Olivia Bennet has everything. A stable marriage, a comfortable country house, a highly successful career as a romantic novelist and the looks and figure of a woman half her age. 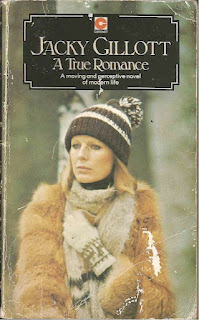 Quick flick reveals: I was attracted to this book because of the magnificent knitwear/fur combo being sported on the front. (Just how cold was it that day?) On the back cover is a photo of the same woman, this time on a bike. Scan available on request. Anyway, after giving the book a little skim, the knitwear is still the most appealing thing about it for me, as the contents just seem a bit grim. A proper reading, however, may well reveal riches. Author Gillott sadly killed herself in 1980. On a lighter note, she did once throw Bernard Levin to the floor after he boasted that he could whirl her above his head.